The Cross Country Tour has the most cargo space of any motorcycle in the world. Its trunk, saddlebags and two front storage compartments provide a total of 41.1 gallons of storage space. Whatever you want to bring, go ahead. With a Cross Country Tour, there’s plenty of room. If your passenger’s not happy, nobody’s happy. The Cross Country Tour has adjustable passenger floorboards that will keep everyone happy and comfortable out on the road. These floorboards can be set in any of three positions over a 2” height range of adjustability, and they can be adjusted at a 10° angle for optimal comfort. The Victory® Freedom® 106/6 V-Twin is a 106-ci powerplant that provides Cross Country Tour riders with 106 ft-lb of torque. Smooth, powerful, and efficient, it’s a counter-balanced and fuel-injected engine that delivers confidence-inspiring performance for touring riders who like to lead, not follow. A Cross Country Tour rider enjoys smooth shifting and great cruising on the open road in 6th gear, which is a true overdrive. Helical-cut gears ensure that each shift is smooth and easy, and neutral assist makes it easy to slip into neutral at stops. The Victory Anti-Lock Brake System on the Cross Country Tour provides riders with peace of mind in all riding conditions. When traction is compromised, the ABS immediately and automatically provides reliable braking to help a rider stop quickly and under control. The exclusive Victory Comfort Control System™ consists of Upper Air Controls and Lower Air Controls a rider uses to manage airflow reaching the riders. In cold or wet conditions, close the controls to block the elements. In warm weather, open them up to enjoy cooling airflow. Once you’re out on the open road, activate the cruise control to enjoy easy, relaxed cruising. This automotive-quality cruise control is easy to activate and set, and it reliably maintains the desired speed. To de-activate it, simply press “Off” or engage the clutch or brake. The open road can get a little rough, so it’s great to have the plush 4.7” of smooth travel provided by the Cross Country Tour rear suspension. Keep the ride consistently smooth with the easy-adjust air shock. Consult the air pressure chart, adjust the air shock with a hand pump and enjoy the incredibly smooth ride – whether you’re riding solo or 2-up, with or without cargo on board. Extend the riding season with the heated handgrips and heated seats. The driver can enjoy heated handgrips with a choice of Hi & Lo settings. The seats feature internal heating elements and the driver and passenger have individual controls with Hi & Lo settings. Add a month or more on both ends of the riding season with the flip of a switch. 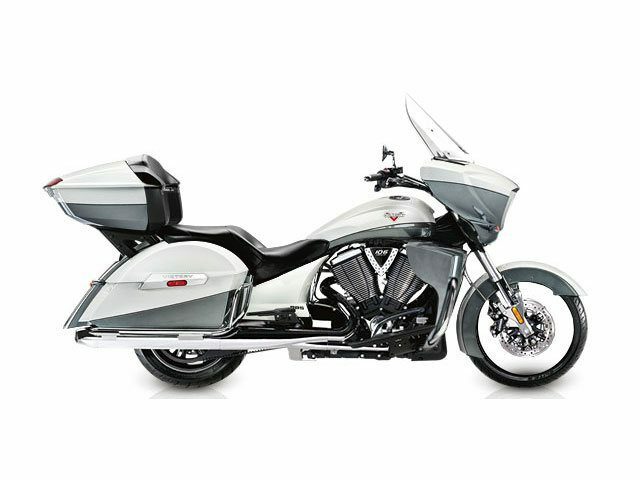 The tall windshield complements the excellent weather protection of the fairing and Victory Comfort Control System. It deflects wind, rain and road debris and ensures a rider will have reliable visibility in all conditions. To customize your bike, there are several Victory accessory windshields available in a wide range of heights, styles and tints. The Cross Country Tour has a 26.25” seat height – the lowest in its class. This helps riders with all inseam lengths plant both feet firmly on the ground. A lower seat height provides the rider with greater control of the bike and enhances a rider’s confidence at low speeds and when stopped. Keep electronic accessories running strong using the Cross Country Tour’s two 12v power outlets. They let riders charge items such as phones, and they can be used to power heated apparel, GPS units and more. Power outlets are located in the left front cargo compartment and in the trunk. Add Victory Accessories and customize your Cross Country Tour® to suit your individual style. All Victory accessories undergo the same rigorous testing as our motorcycles, so they install easily, fit properly, and deliver outstanding performance. Front: 18 x 3.5 in. Rear: 16 x 5 in. Victory® and Victory Motorcycles® are registered trademarks of Polaris Industries Inc. Always wear a helmet, eye protection, and protective clothing and obey the speed limit. Never ride under the influence of drugs or alcohol.